Hi Meg, thanks for taking the time to speak with us today! Could you tell us a little bit about P&O Cruises and your role in the team? P&O Cruises Australia is the backbone of cruising in this region. It is the only homegrown cruise line in Australia and has been sailing in the region for 85 years. Onboard our cruise ships we’ve created a contemporary cruise experience designed with Aussies in mind. My role within the P&O Digital Team is the Digital Product Lead. It’s my responsibility to ensure that our customers are satisfied with their experience on all our digital applications. This means optimising the sites, ensuring content is up to date, gathering feedback and initiating change to improve our online sales and customer satisfaction. 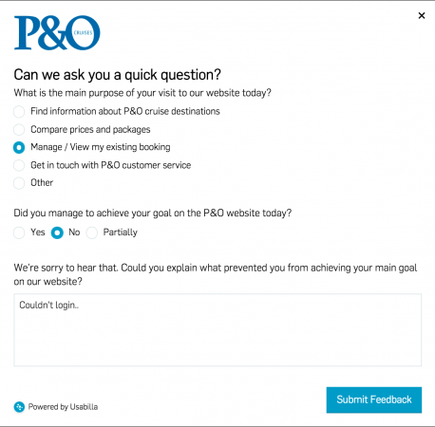 How long have you been using Usabilla, and why did P&O decide to invest in a User Feedback solution? I decided to engage Usabilla for onsite feedback a little over a year ago. We needed a platform to allow users to provide real time feedback when using our newly launched cruise personaliser website ‘Cruise Control.’ Prior to that, our feedback was either through the Customer Service Team, social media or post cruise surveys which are rarely timely. Using Usabilla allowed our guests to quickly notify us of bugs, sentiment or features they wanted and allowed us a quick, detail-filled solution to pass this real-time qualitative and quantitative data onto our development team to ensure a streamlined and fast turnaround on development changes. We have since rolled out Usabilla across our customer booking site for feedback on the booking process. You won the Mumbrella award for Best User Experience in 2018. Congratulations! Could you tell us a little bit about how/why your team won? Last year we focused heavily on redesigning and optimising our booking funnel on site. Our feedback showed our guests felt overwhelmed with so many decisions to make when booking a cruise online. We set ourselves the challenge of growing bookings through great user experience and completely re-thought and re-designed the purchase flow from the Homepage, IA/Navigation and search to the cruise itinerary booking pages and checkout. We introduced a ‘digital concierge’ to help guide guests through the checkout process and introduced elements of personalisation ‘smarts’ throughout. The results were astounding and something we are all very proud of. We saw an overwhelmingly positive survey feedback by our customers on Usabilla (4.3/5), with a word cloud dominated and almost exclusive to ‘easy’. 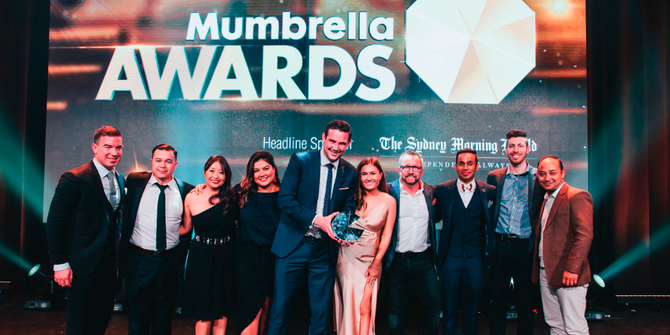 Winning the Mumbrella and Mumbrella Travel Awards for Best User Experience was an honour and fantastic way to reflect the achievements made by the team for the business. How would you say User Feedback has contributed to improving the User Experience at P&O Cruises? The ability to streamline the process of passing on feedback in real time, with all the data necessary to replicate and easily pass that information to our external development agency is invaluable to me and our developers. The process is far quicker than it used to be and as a result, we are more effective in quick reactions to issues and changes. Being agile in our approach allows us to solve problems faster and give guests experiences they want and love sooner. Our developers now have additional context to bugs and that transparency also helps when discussing motives for changes in functionality being proposed. Could you give an example of a success that Usabilla has helped you achieve? I noticed a number of Usabilla feedback items relating to login issues on Cruise Control and was able to easily identify what areas specifically users were struggling with. We prioritised a fix for the login and also introduced a new troubleshooting guide feature that answered a number of concerns raised by guests. Our login changes made as result of Usabilla feedback increased successful logins and reduced service calls. Any cool new ‘Customer Centric’ initiatives that your team is working on, where you plan to use customer feedback? In the future, I’d like to introduce a Group Booking tool. The aim is to help encourage and facilitate group bookings better and give them the tools they might need to make booking a group cruise through our website even easier. Booking any group holiday can be difficult. Each group case is unique with a high number of variables and considerations and therefore harder to match specific use cases to upfront – something that could take a very long time. My aim is to release an MVP to a small audience and continually tweak and optimise based on feedback given through Usabilla. Last question, thanks so much for your time. Is there anything else that you would like to share about your experience with Usabilla? We are very happy with not only how Usabilla has improved our feedback channels online and our ability to react in an agile manner but also how much it has proved a valuable asset for our development team – a bonus we were not expecting but are very grateful for. Usabilla has empowered us to create change and build products we can clearly see our users want and need. Have a quick chat with the team to learn more about how Usabilla can work for your organisation.